The Malaysian martial art form called silat. My experience in Islam began as a graduate student in New York City in 1998. Up to that point in my life, for 25 years, I had been a Protestant Christian, but had not been practicing my religion for quite some time. I was more interested in “spirituality” and looking for anything that didn’t have to do with organized religion. To me, Christianity was out of touch and not relevant to the times. It was hard for me to find anything in it that I could apply to my everyday life. For me, this difficult and very vague relationship with our Creator left me searching for something that could provide me with a better understanding of God, and our relationship to Him. Why couldn’t I just pray directly to God? Why did I have to begin and end every prayer with “in the name of Jesus Christ?” How can an eternal, omnipotent Creator and Sustainer also take the form of a man? Why would He need to? These were just a few of the questions that I could not resolve and come to terms with. Thus, I was hungry for a more straightforward and lucid approach to religion that could provide my life with true guidance, not just dogma that was void of knowledge based in reason. While in graduate school, I had a Jewish roommate who was a student of the martial arts. While I was living with him, he was studying an art called silat, a traditional Malaysian martial art that is based on the teachings of Islam. 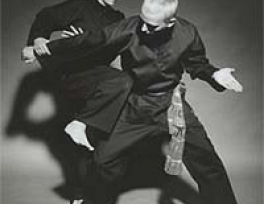 When my roommate would come home from his silat classes, he would tell me all about the uniqueness of silat and its rich spiritual dimension. As I was quite interested in learning martial arts at the time, I was intrigued by what I had heard, and decided to accompany my roommate to class one Saturday morning. Although I did not realize it at the time, my experience in Islam was beginning that morning at my first silat class in New York City back on February 28th, 1998. There, I met my teacher, Cikgu (which means teacher in Malay) Sulaiman, the man who would first orient me to the religion of Islam. Although I thought I was beginning a career as a martial artist, that day back in 1998 actually represented my first step toward becoming Muslim. What made my orientation to Islam so powerful was that as I was learning about it, I was also living it. Because I studied at the home of my teacher, being in the presence of devout Muslims allowed me to be constantly surrounded by the sounds, sights and practices of Islam. For as Islam is an entire lifestyle, when you are in an Islamic environment, you cannot separate it out from everyday life. Unlike Christianity, which lends toward a separation between daily life and religion, Islam requires its followers to integrate worship of Allah into everything we do. Thus, in living with my teacher, I was immersed in the Islamic deen (lifestyle) and experiencing first-hand how it can shape one’s entire way of life. to me. It was also very foreign in many ways and the amount of discipline it requires was difficult to understand. At the time, I was liberal in many ways, and was used to shunning anything dogmatic or imposed, regardless of where it came from! As time went on, however, and my understanding of Islam grew, I began to slowly see that what seemed to be religious dogma was really a lifestyle put forth to us by our Creator. This lifestyle, I would later learn, is the straight path to true contentment, not just the sensual and superficial way of life that my society and culture promote. I realized that the question is quite simple actually. Who could possibly know better what the best way of life is for human beings than the all-wise Creator? American culture is highly influential on how we see life because it constantly bombards us with sensual gratification aimed at appealing to our worldly desires. In America, happiness is defined by what we have and consume, thus, the entire culture is geared toward the marketplace. Unless we are removed from this type of environment, it is difficult to see its drawbacks, which are based on worshipping and putting faith in everything but God, the only One that can provide us with real, lasting contentment in our lives. With this realization, not only did I decide that Islam was relevant to my everyday life, but I began to understand why it is so different from other religions. Only Islam provides knowledge and guidance for every aspect of life. Only Islam provides a way to achieve health and happiness in every dimension of life—physical, spiritual, mental, financial, etc. Only Islam provides us with a clear life goal and purpose. And only Islam shows us the proper way to live in and contribute to a community. Islam is what everyone needs, and what so many who have not found it yet, are searching for. It is the path to purpose, meaning, health and happiness. This is because it is the straight path to the source of truth and real power—Allah. It was only until I actually became Muslim that I realized just how encompassing the Islamic lifestyle is. Literally everything we do has one underlying purpose – to remember Allah. The lifestyle provides us with the way—not just the understanding—but an actual method of constantly remembering our Creator in as simple an act as greeting someone, or getting dressed in the morning, or waking up from sleep. Islam shows us that by remembering Allah, everything we do becomes focused on Him, and thus becomes an act of worship. From this, our energy, our thoughts, and our actions all become redirected away from unhealthy and useless causes and focused on the source of all goodness. Thus, we are continuously tapping into His divine strength, mercy and grace. So, by remembering Allah constantly, we become stronger and healthier in every aspect of our lives and not distracted by self-defeating thoughts and behaviors. There still remain some minor aspects of Islam that have proven to be somewhat difficult adjustments for me. Nevertheless, I thank Allah everyday for the ease to which He has allowed me to make the necessary changes in my life so that I can continue to live in America and still be, Insha-Allah, a good Muslim. As a white, middle-class American, many cultural aspects of Islam are quite different from the way in which I grew up. In fact, when I finally broke the news to my family that I had become Muslim, almost all of their questions and concerns were related to cultural differences—marriage, social life, family, etc. They were much less concerned about my general beliefs about God and religious practice. For my family, friends, and co-workers, becoming Muslim was not seen necessarily as a negative change, but it has required a great deal of education about Islam. Because acquiring knowledge is a critical component to a Muslim’s development, having a teacher who has taught me how to apply Islam in everyday life has made all the difference in managing whatever difficulties I have experienced from my reversion. Having someone knowledgeable you can turn to whenever you have questions is a wonderful support that every new shahadah should go out of their way to find. Islam is not a religion that can be rationalized, in the way that Christianity and Judaism are. It is a clear path that must be followed just as Allah has laid out for us through the Quran and the lives of our beloved Prophet Muhammad (peace be upon him), his companions, and the saints of Islam. But when we have the support of a knowledgeable, experienced teacher, who is able to apply the universal teachings of Islam to his life, then the truth becomes clear from error, exactly how Allah (SWT) describes in the Quran. From this, we are able to understand how to apply Islam correctly to our own lives, and Insha-Allah, receive Allah’s many blessings. The ultimate test, however, of anyone who claims to have true and right knowledge, is to look at how they apply it in their own lives. If their actions support their teachings, then and only then should we look to them for guidance. Through Islam, I know why so many people who do not believe have so much fear inside them. Life can be very scary without God. I know, because I once harbored that same level of fear. Now, however, I have the ultimate “self-help” program. It’s the self-help program without the self. It’s the path that puts everything is in its proper place. Now, life makes sense. Now, life is order. Now, I know why I am here, where I want to go, what I want my life to be, how I want to live, and what is most important not just to me, but to everyone. I only hope and pray that others who have not found the path yet, can feel the same that I do.